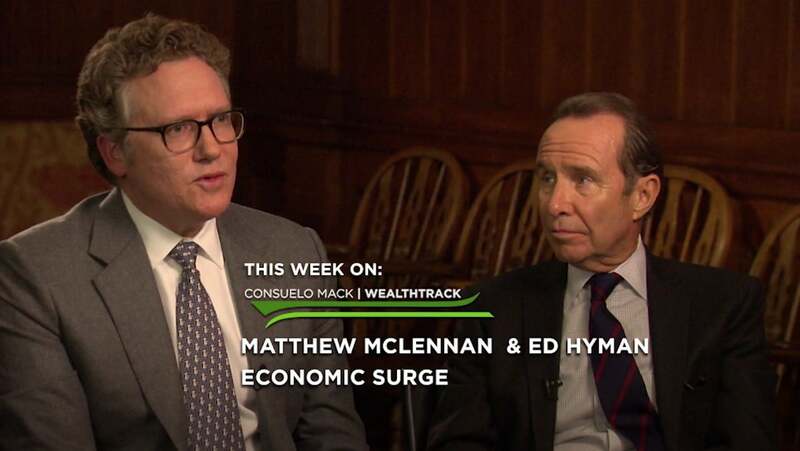 It’s been a longstanding tradition and privilege of ours on WEALTHTRACK to have Wall Street’s long time number one economist, Ed Hyman join us exclusively to share his views on the economy and markets. This week our focus is the U.S. Next week we will look beyond our borders to the world at large. Hyman is Founder, Chairman and Head of Economic Research at Evercore ISI, a top ranked macro and investment research firm. He has been voted the number one economist on Wall Street by Institutional Investor’s survey of professional investors for an incredible thirty-seven years. His comprehensive, but succinct and easily digestible daily macro research reports are considered must reads by professional investors. We always ask a leading portfolio manager to join Hyman. For the second year in a row we are delighted to have First Eagle Investment Management’s Matthew McLennan with us. McLennan heads up the firm’s Global Value team, overseeing $111 billion in assets. He is portfolio manager on several funds including the firm’s flagship First Eagle Global Fund which has delivered strong risk adjusted returns over many years under McLennan’s decade of leadership and before that under legendary value investor Jean Marie Eveillard. To understand where we are going it helps to understand where we have been. A central thesis of Hyman’s is that the stock market drives economic activity. Since 1968, that’s a 50 year stretch, the S&P 500 has increased 20% or more only 12 times. Last year it came within a hair of doing so with its 19.4% gain. In 10 of those 12 times the economy was strong the following year. Taking out the effects of inflation, real GDP increased 2.7% or more. So 83% of the time economic activity was robust. The average for the 12 years after market advances of 20% or more was 3.4% real GDP growth. The S&P last year had another distinction. According to Hyman’s team it had a “perfect” year. 2017 was the first year ever that the S&P posted positive total returns - including dividends - every month. The previous closest perfect year was 1995, which had only one down month. The market that year was up 34%, the following year it gained 23% with dividends included, and real GDP was a gangbusters 4.5%. Nearly nine years into an economic expansion are we in for a period of accelerating economic growth and even a rare super bull market? Those possibilities are part of this week’s discussion. We are excited to begin a new year with you and look forward to helping make it a profitable and productive one!